I just realized last night that I forgot to announce the winner of the Wings of Love Class kit! Thanks to all those who purchase felt products at Brooke's Etsy shop! I entered everyone who e-mailed me and who posted on my blog that they had made a purchase! The winner will received a full class kit for the "Wings of LoVe" Class. That will be shipping in mid-late august. It has tons of fabulous products with a retail value of over $40.00 and the class is so fun! Lots of winged themed products in it. so.. life is crazy as usual.. I keep forgetting we are moving in like 2 weeks! I mean I remember, then I forget and then I remember.. then I forget.... and I haven't even started packing! Ben is busy finishing our basement in the house we live in (before we close on THIS house at the end of august). We close on the house we are buying in two weeks and before we can move into it, Ben is going to texture the entire house with the "sun valley" texture and repaint everything. We decided yesterday to replace the carpet in the living room too. It's actually fairly new, so we will re-use it in Braden's room (which isn't finished) and the family room (which is now the garage, but will soon be the family room). ah! hard to keep straight! I also keep forgetting we are moving into a smaller house.. but it's okay because the backyard MORE than makes up for it.! Well busy working today, getting some assignments done for MM and BHG. We have a Campbell/Hoggan family reunion at the end of this week. It's only a sibling reunion (just my bothers and sisters and step brothers and sisters) but there are 13 kids total combined. All but 3 of us are married and so you can imagine how many kids (grandkids) will be there. I can't wait to see everyone and spend time with them! Ben and I are in charge of it... the food, the games, the agenda.. etc. so we decided to hold it at our favorite campgrounds and hot springs.. downata. Love that place! Well besides house stuff and reunions, school also starts in 2 weeks! Crazy crazy! Luckily I bought most of Allie's clothes this spring at a sale Children's Place was having on all their winter clothes. It was a one day sale that I happened to walk into. A few of my friends and I from Shelley drove down to Utah and went to the outlet malls in Park City. The whole mall was having a store-wide clearance.. but Children's place was having a CRAZY sale.. most things were $.99-$4.99 (for shirts, pants, shoes). I also had a 20% coupon off for my entire purchase, so when it was all said and done I had bought Allie 19 shirts and 7 pairs of pants and my total came to like $28 bucks! CRAZY!! I also bought my boys alot of clothes there too, and at Wal-mart and old navy when they had their winter clearance sales last year. Got most of their pants for $3.00 and shirts for $2.00. We are pretty much set for clothes except Braden who grew WAY more than I thought he would between now and then. He is almost 12 but wears a size 14 in pants because he is so tall! Luckily Parker (who is 11 months younger then him) also grew alot and will fit into the 12's I bought Braden. Well have a fabulous Monday.. lots of fun stuff to share with you over the next couple of weeks.. class stuff, retreat info and even another surprise.. (I know.. I know.. not that again).. Okay, so I know it's been almost 2 weeks now since the trek and I really need to share my experience with you. For those of you that don't know. 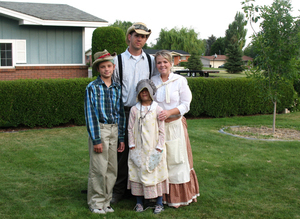 My husband, and two of my children, went on a Pioneer Trek about 2 weeks ago. We are LDS (Mormon) and this experience gave us such a huge appreciation for what our ancestors went through to have freedom of religion. 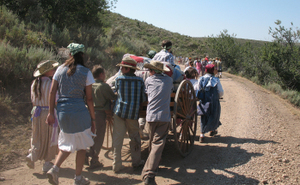 The Pioneers crossed the plains (from Iowa City to the Utah Valley over 1300 miles) in the mid 1800's. Over 70,000 men, women and children...came across those plains on foot, pushing handcarts somtimes in wagons. You can read more about their stories here. I first have to say that we have such a GREAT ward and really had a good time. The kids were fantastic and I couldn't believe their strength! They didn't complain really at all and it was hot and near the 100's the entire time. You can see from the pictures below, we were mostly in the sun. The first day we all met at the starting point (men, women and mostly teenagers from our ward) and we were put into "families". Ben and I were a "ma and Pa" over a group of teens along with our own two kids and another set of parents. We loaded up our handcarts with the supplies and belonging we would need for the next 3 days, then set out on foot pushing our handcarts. 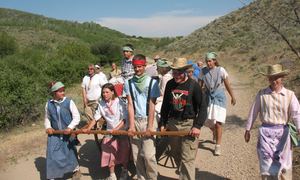 We pushed our handcarts uphill the the entire first day... from around 10:00 am until about 6:00 in the evening. When we got to where we would set up for the night, , there was still no relief from the hot sun. But we set up a couple of really big tarps over the handcarts to provide some shade and a canopy for the kids to sleep under. I will admit it was so tiring, and there were SOO many times during that first day that I thought there was NO way I was going to make it! I really did. I couldn't believe how draining it was. I kept thinking how lucky we were that we didn't bring our younger kids and then I thought how the pioneers didn't have that choice. They brought entire families of all ages! Most of them didn't have the nice hiking boots or good supporting tennis shoes that we had. When we finally stopped for lunch I was just so grateful to have a little break. But the kids in my group just kept me going. They called me "ma" and always made sure I didn't fall behind. We had such strong kids (mostly ages from 10-15) mixed with both girls and boys. And to be honest... they were pushing the cart so fast most of the time, that I had a hard time keeping up with them just walking! After lunch on the first day, we came to a pretty steep hill. At that point our leaders told us that all the men and young men.. really any boys of any age, where to leave us and go on ahead. We were told that this would be the part where the women would pull. WOMEN ONLY. It represented the time when the pioneer men were called to serve in the Mormon Battalion and we had to do it all on our own. I was so tired and we were so hot and I almost got tears in my eyes when I saw all the men leave us. But I was SO impressed with the girls in our group and the power we had to make it up the steep climb. It was hot and long and just as we were nearing the top, I could hear cries of joy behind us and I looked back to see the men and boys coming out of a group of bushes and trees just below us. They had been hiding there and watching us do the pull on our own. When I saw the boys that were in our family come running up the hill towards us, I had to catch my breath because I felt such a surge of love and the spirit so strong. It was a very proud and humbling moment for me. I wish I had a picture of that moment. The first night we stopped for camp, they really wanted us to feel what the pioneers felt. So we only had biscuits and broth for dinner. We were so hungry and tired from pushing all day and that food, as little as it was, tasted so good. 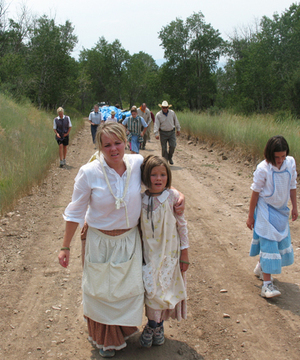 We were lucky as we could eat as much broth as we could handle, but it was also humbling to know that the pioneers were given at one point, only about a 1/4 of pound of flour per day, to live on. That is about one biscuit a piece per day. That's all they had to eat, or they would run out of food before they reached the Utah Valley and starve to death. They trekked usually around 12-20 miles a day on a good day and 8-12 on really rough days (when the snow was 4' deep and the wind was hallowing and it was below freezing). We only trekked 6 miles each day! 6 MILES!! I couldn't image doing 12 or even 20!! 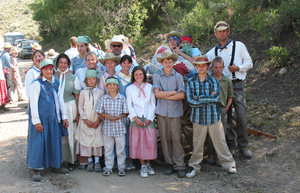 Those pioneers were amazing and had amazing strength and an amazing testimony of the gospel to leave their nice homes, warm homes and travel across the United Stated on desert land, over 150 years ago. It's crazy to think about it really. I don't know if I would have had the courage to do it! We only trekked 6 miles and THAT was pretty hard on our bodies! I mean I thought I was in shape, but i guess not! I got major blisters the first day of the trek and had to cut holes in the sides of my tennis shoes, so my big toes could stick out the sides... just so I could bare walking the next 2 days. Ben made me some make shift flip flops the first night, out of some foam and zip ties he had brought. Pretty cool I must say. It was nice to get my feet out of hot tennis shoes and socks and let my blisters cool off each night. On the second day I was so dang hot (we stopped for camp in the middle of the day and it was nearly 100 degrees with NO shade.) Ben was busy with other things and I was too impatient to wait for some relief from the sun, so I used some large sticks (about 4' tall) that I found around camp, some rope, a tarp and zip ties, to create a canopy over my sleeping bags, so I could lay and get some relief from the heat! It worked out pretty good. I decided that I really need to include a package of zip ties in my 72 hour kit.. they are great for just about EVERYTHING! anyhow.. I am so glad I went on the Trek. The last night we had a camp fireside and the kids along with alot of the adults (including myself) bore our testimonies about our experience. It was humbling to listen to the teenagers really open up with how they felt. Just a good time. I was actually sad to go home and leave our little "family". We had grown so close! Well here are pictures of the Trek. The first ones are of Ben, Braden, Allie and I the morning we left for the Trek. Nice and perky, clean and full of energy. As the pictures go on, you can see the faces go from perky to tired, to exhausted, to very very dirty! but I would do it again in a heartbeat! The last picture is of our "family".. the group that we were with most of the time. REALLY REALLY Good bunch of kids. Would be proud to call any of them my own. We decided we need to get together and have a "trek" reunion this fall and do something fun. Even though we see them every Sunday at Church.. it's not the same as spending one on one time together. Well we are off to Utah in the morning for my mom and step-dad's birthday bash! We are going to Roy Water-park in Roy, Utah and then having a fun dinner that night at a near by park. Tomorrow night we will be spending the night with my friend Jamie Soucy. BOY is she in for a treat (all 8 of us at her house!!) so fun! okay so here are the pics. The first one like I said is of us before we actually left. The second is once we arrived at the place we were starting our trek from. 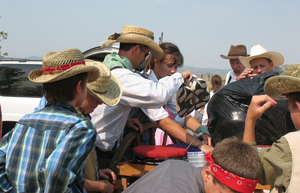 That's Ben and some of our "family" loading up our handcart. 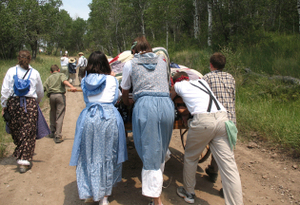 Each family had one handcart to stow all of our personal belongings on (including clothes, eating utensils, sleeping bags, personal items, etc.) We also had a 5 gallon drinking bucket to be able to drink from all day long. The next few pictures are of our family pushing the first and last day of the trek. I didn't take any pictures of us at actual camp (should have, but was too hot and tired to remember). The last picture is of our family the last day, about 2 hours from our final destination. First off, THANK YOU to everyone who has supported my SIL Brooke in her new adventure! I know she is just so excited and overwhelmed by the kind response to it! If you knew her, she is so shy and quiet and all the kind words and buzz about her new products seriously make her blush!! She scrapbooks, but is not in the on-line scrap-booking community and so this is her first taste of how great our on-line scrap-booking community really is! SO THANK YOU!! She is married to my younger brother and she has always just been so sweet, so quiet, and I am sure she has found our family to be very loud, very outspoken and sometimes not so sweet! LOL.. so she is a good balance for us. Anyhow Thanks to all of you! YOU all ROCK! e-mail me! and I will get those out to you asap! If you ordered the felt pieces and got them already (Brooke was pretty fast about mailing them out), let me know what you think! 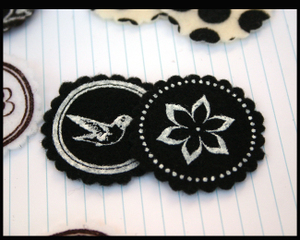 Alot of you e-mailed me and asked me about the ones in the last picture from my post (the black and white scalloped ones with the birds on them.) They were called Scalloped MOD and those sold out fast but I will let you know when she has those back in stock! Now for CHA! CHA is always fun. Always lots to see. This show I also had the pleasure of meeting alot of people that for years I only "heard" about, but never had the opportunity to meet. I was also SO excited to bump into a few of my blog readers at the show and got some pics from them! These are with Amber and Carolyn who are always so great on my blog... SO great to meet you two finally! I was shocked at how tall both of them were! ..or maybe it was me who was so short? I finally got to meet Jodi the owner of Fancy Pants. WOW she is great. Had a good talk with her and she is just so sweet and has great products. Really impressed by how fast that company has taken off in the last year or so. GREAT products and a really cool person! I also got to finally meet, Rachel the owner of Basic Grey. I had heard so many great things about her over the years from design team members at CBX who had worked with her, so I finally got the chance to meet her. She was so nice and Sooo down to earth! She was funny and we talked alot about some books we are reading right now (a thousand splendid suns and twilight). We also talked about our church and her teaching Gospel Doctrine class. (wow, what a calling) and I could tell she was just great at it. I was just so impressed by her. I also finally got the chance to meet Greta Hammond, who I believe is not only one of the most talented people i have seen in many many years, but also just a NICE person! I always love seeing her work in BHG and it was nice to finally put a name to a face! 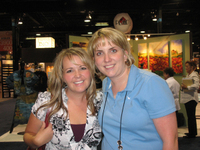 I got to meet alot of the new BHG creative team girls for 2008 and they are so nice in person as well. You know for all of the "smack" that goes on, in some of the on-line communities, I was really impressed with how nice and down to earth everyone I met was. We ALL (as a whole) are really are lucky to know such a great bunch of ladies. I mean everyone too, not just those who work for manufacturers or on design teams with magazines. There are those who I have met through my blog, through twopeas. Etc. Seriously just a good community we have. Glad to be a apart of it. You should be proud of yourselves for making this such a great place to come and share our lives and our art. Of course I also got to spend time with some of my closest friends. I got to have some good talks with Michelle Hill (a very VERY talented and beautiful person). Enjoyed seeing her.. always do. I also spent lots of time with Courtney who was fabulous to room with. She is so laid back and relaxed so it's easy just to feel comfortable around her. We left the show early the first day and went on a shopping trip to the Woodfield Mall. That was fun. She is just so fun to be around. The last night I got to room with Margie Romney-A from Making Memories and as many of you, she is SO funny and such a hoot to be around.. but the side I love best, is the side I get to see when it's just her and I. She is such a spiritual person and such a good mom. She really has a good heart and a love for the Gospel. We had some really good talks just about life, our kids, ourselves and it was nice to just catch up. What a great person she is. Well as far as product goes.. It was overwhelming what I saw! I am so glad I got catalogs so I could come home and remember it all! I saw some really cool fun felt products from both Fancy Pants and Prima! Can't wait to get a hold of those. I also saw some fabulous new papers from Scenic Route, Daisy D's, Basic Grey (love the new fall line from them), American Crafts and Tinkering Ink! OH and Rusty pickle has this seriously cute pirate princess paper. SO dang cute! I loved all the new books from Maya Road.. oh so great for classes and Melissa Frances has some awesome winged products I can't wait to get a hold of for classes! Their fall paper line is so cute too! I usually take a ton of pictures of the products, but didn't this time! I think I was so worried about getting through all the booths, since I skipped out on the first day, that I forgot to stop and take some time to get pictures! Heidi swapp has some awesome new butterfly masks and Autumn Leaves.. OH can't wait to get some of their news stamps in for classes. YOu are going to love them. 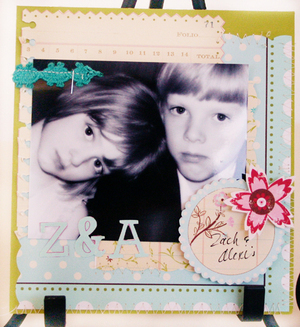 Of course Making Memories had BEAUTIFUL products.. their new noteworthy line.. is to DIE for! 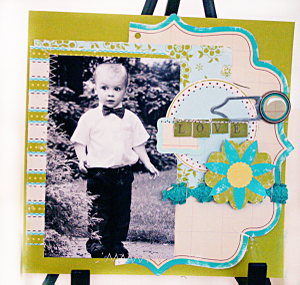 In fact.. here are a couple of layouts I did using their products. (these are for packaging). All in all, CHA was great. Glad to be home though. 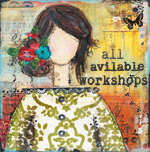 Just watch for all of the fun new products showing up in my fall classes. I seriously can't wait! I still need to fill you in on the TREK pictures from a couple of weeks ago. I will post about those tomorrow. I also will have a FINAL update on the retreats for September and October by next week and final cost etc, so you can start officially signing up for those. Thanks again for all of the fabulous support for Brooke and for those who purchased class kits from my SIL, Cathi. (she still has a few kits left by the way if anyone is interested!). What a great community we have! oh and one more thing! 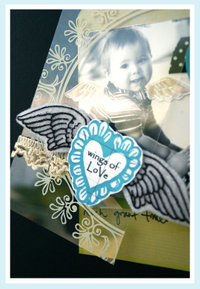 don't forget.. if you PURCHASED any of the felt pieces from Brooke, make SURE you e-mail me mailto: christytomlinson@gmail.com, to be entered in to win one of my 'Wings of LoVe" class kits. I am doing that on Saturday! okay so to tell you a little story.. (oh how you all know I like to tell stories :) ..... ). a few months ago, I was talking to my sisters and SIL's at a family gathering, and we were discussing our lives and the subject somehow ended up on my classes, kits, teaching etc. I was telling them I was just getting ready to start designing all of my fall classes and couldn't wait because I had a few in mind that I really was excited about. One of them was a class called "wings of LoVe" (using winged theme products) and another was class that involved a butterfly theme. I was also telling them how I really was into felt products at the moment but hadn't found anything out there that was printed. 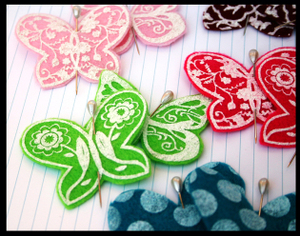 I started envisioning printed felt pieces like butterflies, flowers, wings and so much more... to add to my class embellishments for fall... and the more we talked, I started thinking.. I should make them, or have them made.. etc. so I really could put them into my classes!!.. but also realized I didn't really have the time to take on another project. Soooo I suggested that one of THEM do it and then I would just buy it from them instead! We talked all night about the details it would involve, what I would love to use for my classes, etc and to my excitement, my SIL, Brooke (who lives close by) said she would take it on. It took her a while to get all of the logistics figured out and to design all the different things I wanted, but I was so excited when she showed up at my house a month or so later with samples of her handmade felt pieces for my classes! AHH! I was in heaven! Exclusive embellishments just for me!.. so blessed. well, after seeing a few of the samples for my classes, I told her she really really needed to make these available to others too! (not the same as mine of course.. (hee..hee..) but I told her about etsy, and how it was a place where people could sell handmade goods and that she really should think about doing it (besides just for me). Soooooo she went back to the designing table again and came back a few weeks later with even MORE fabulous designs. I got to tag along on a fabric shopping outing one morning and watch as she picked out all of the fabulous colors for her projects. SO yummy! and now this morning, I got to see all of the gorgeous embellishments in person! So fun! So before I drag this out any longer.. here is a few samples of the things she has for sale in her store.. oh!! but before i do that.. I wanted to post a sneak peak of the "wings of love" class so you could see the printed felt wings incorporated into a project! You will get a couple of these in the class kit (the kit will go on sale officially in august) but you can buy other wings designs in her esty shop NOW too! I don't have the class kit for sale yet, but if you want to be on a waiting list, you can e-mail me here. Here is a sneak peak of just a few of the pages (it's a tag mini album). I will post more in august when the kit goes up on my blog. I only have a limited amount of these available and they will sell for $32.00 plus shipping. If you got the last class kit "lessons learned" you know it will come with tons of fabulous products and really detailed written instruction. 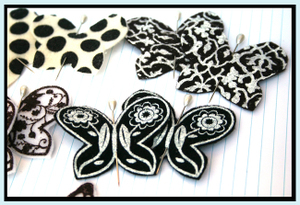 The kit not only include the new printed felt wings, but lots of other fun winged products as well including stamps, rubons, fabrics and papers from hambly screen prints, scenic route, american crafts, bazzill and more.. plus buttons, chipboard, exclusive trims and ribbons and more. So e-mail me to be on the waiting list! Okay now onto just a FEW of the fabulous printed felt pieces you can purchase on Brooke's Etsy shop. Her shop is called TatteredTags. Everything you see is handmade and hand-cut. She did a fabulous job at designing them too (with a little help from another talented sister Leora Sanford). I am so excited about them and hope you are too.. thanks for putting up with me over the last week!.. and just so show you my appreciation for being so patient.. I am going to do Two giveaways. for my first giveaway just leave a comment on THIS post and you will be entered to win a set of the butterfly sorbet packs. This will go until Wednesday night at midnight. My second giveaway will be from Brooke's etsy shop. For those of you that purchase a set (or sets) of Brooke's goodies, and then e-mail me to say you did, you will be entered to win one of my "wings of love" class kits (which ships in august and has a retail value of over $40.00!) This giveaway will go until this friday at midnight! I will post about my "news" tonight! I am SOOO excited! I got to see them this morning and all I can say is... SO stinkin CUTE! oh so seriously CUTE!!!!!! can't wait to share it with you too! about revealing the surprise (okay maybe I did.. I totally thought yesterday was Thursday when I woke up today???). and I want to share with you so badly BUT I still don't have pictures yet and I just can't share without pictures! I e-mailed my "person" today to see when the surprise will be ready for pictures, so I am just waiting to here. I doubt it won't be until next week.. PLEEEEEASE don't hate me for the wait!! I promise there will be a giveaway involved when I finally do! But honestly I just can't do it without pictures.. and all I can say is it's so stinkin cool and cute! I can't wait either!!!!! I noticed yesterday someone guessed it was I was on the LOVE Elsie design team.. sorry..... no..I am exclusively on the MM design team. But that love Elsie stuff is fun isn't it? okay sorry no updates from CHA.. because I haven't been over there yet this morning. But we are on our way, so tonight I will post more! I just had to post really quick about the news I had to share! I am here at Cha!! oh yesterday was a LONG LONG day... left my house at 5:30 in the morning and got here last night at 7:00... so glad to Courtney for picking me up. I went on southwest and flew into Midway instead of O'Hare.. which is 30 minutes away from CHA. So I would have had to take a shuttle bus to the O'Hare airport (50 minutes) and then a bus to MY hotel from the O'Hare airport. She ROCKS! thanks court! Had fun last night! We went out to dinner with a bunch of the Editors and staff at BHG last night. To Gibsons.. YUMMY food. Leah Fung took pictures but alas I had left my camera in the hotel! So this morning walked around the show floor and was so overwhelmed! I mean some way cool WAY cute stuff out there for classes. 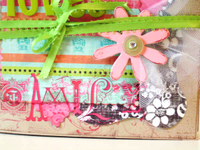 Lots of fun mini albums to alter from Making Memories, Basic Grey, PRIMA (way way cute embossed chipboard books). I can't wait to get home and start planning my classes and add to the ones i already have in the works! I also some really cute paper from Tinkering Ink that I want to include in one of my classes and some of the new Heidi swapp stuff! OH CAN"T WAIT!!!!!!!!! I know this is a little bias.. but the new Noteworthy line from making Memories is just freaking amazing!! I have already put in my order for stuff to include for one of the class kits. YOU ARE GOING TO DIE when you see it! Already bumped into a lot of fun friends today, good to see everyone. But for some reason i am really homesick this time! I am already ready to go home!! (what is wrong with me???) Lol.. I didn't take pictures, but when I get back this afternoon I will (Came back to the hotel to rest a little.. so tired!). Well I wanted to also say thanks to everyones comments. I hope I didn't come across as complaining about my friend. She really truly is an amazing person. Always the first one to help someone out. She is always making dinners for young moms, watching kids for others.. always so willing to serve. You have to keep in mind she is ALSO not a scrapbooker and doesn't get the whole on-line community thing. Or even what a blog is. But thanks again for your kind words. I also have to say that Debbie Hill ROCKS. She is one of my closest friends! Though I am mad at her for NOT coming to CHA this year. She works for Junkitz and didn't come. (miss you). anyhow..back to CHA.. I will post some fun picture tomorrow.. and more updates! one more thing I just had to comment on.. kinda funny but also something I feel REALLY bad about. I got a call tonight from my dear friend Jenn from Nampa, (you've seen her on here before. I have taken photo's of her pregnancy and her family etc). Anyhow she calls every once and again to make sure I am still alive and fill me in on all things good in Nampa and with her family. She is so funny and I always smile through our entire conversation because she is just so real and just says it like it is. Something I can't always do. She mentioned that she reads my blog once in a while but had to tell me something and hoped it didn't hurt my feelings. She said that if she didn't know me and she was reading my blog as an outsider, that she would think I was " really stuck on my self and a total snob". She said the way I write and what I talk about (traveling, my jog, about my life, my family etc) that I come across as someone who is always just bragging about my wonderful life. We laughed about that because if you knew me (and she does really REALLY well) that my life is not always wonderful OR perfect. She went on to say that she is glad she really knows me, because I am actually pretty down to earth and not into who has what or care what car anyone drives etc. But I felt bad.. SHE didn't make me feel bad.. it was ME who felt bad that I come across that way in my posts here on my blog! I remember Debbie from Junkitz (whom I met last year in November) had said the same thing last year (you can read about it here). She said that based on my picture, she thought I was a very proper person and though she won't admit it, was pretty sure she used the word "snob", in our conversation! LOL.. Anyhow.. she thought that about me, just based on the picture that I have for my profile picture here!! (oh so sad because the honest truth is I hadn't washed my hair for days and was actully in my PJ's when that picture was taken of me). oh the truth be told.. I am so just laid back. I always feel bad when people get that impression. TRULY I do. I also read recently on one of those not so nice message blogs something similar. I won't go into details but basically the anon poster said that "christy thinks she is bigger than she really is". I felt SOO bad that someone got that impression from me. wow.. felt really bad I didn't mean to give the impression to anyone. Anyhow, just had to share that and hope that all of YOU haven't gotten the same impression... if you have.. come spend a week with me at my house! I am totally inviting you.. and then you can really get to know me :) and just see how normal and crazy my life is like everyone else's... I guess I just feel so blessed for everything I have been given in my life, so I like to express my gratitude for those things. not to brag, but to show my appreciation. anyhow.. soooooo check out Cathi's blog! Fun stuff on there! Now I am off to get kids in bed for the night. Have a great weekend. I will post updates from CHA if I can! Well that's a little unfair.. there were guesses that were sorta close and a tiny bit right, but not really.. and the bad thing is, I am still going to make you wait to find out what it is!! I am still waiting for pictures before I tell you because it wouldn't do the surprise justice if I didn't have pictures!! But it does have to do with Scrapbooking and some FABULOUS new products (i heard I should have them on Friday). I can tell you I am NOT pregnant. (wouldn't having another one but alas we are done, actually have thought about adpoting from China....). I am also NOT doing my own book (but wow, thanks for those comments). I HONESTLY don't think there would be enough interest in a one man book filled with only Christy's layouts in it! . Also on the editor thing.. No, I am still only a contributing editor with Scrapbooks Etc, and I love my job. I also am the Educational Coordinator so that is fun as well. As for my own collumn in the magazine.. well that actually wasn't what the surprise was BUT!!! in the October issue i do infact have a new collumn starting!!! I can't wait to spill the beans about that one! I share that collumn with Erica Hernadez (love her work) and the name of the collumn is soo cool. Reminds me of a super hero.. more on that later. And new product with MM, nope.. I am only a layout/project designer for books and packaging etc, not a product designer for them and I love it that way! Starting my own kit of the month club: while I WISH this was the case, and I have thought about it sooo much over the past 6 months (some of my closest friend know how much thought I have put into it) ... I honestly have to say the only thing holding me back is the fact I see new Kit clubs pop up each month and they are so fabulous I wonder if I can compete! I have actually put a ton of thought into this, and have some really fun and different ideas for it, but just not quiet ready to take the plunge yet. But if I do, you will be the FIRST to know! So that's it! I know you still don't know what the news is is.. but you are going to LOVE IT!!! okay now onto our winners! So I randomly picked two winners and it was funny because they actually posted really close to each other.. to funny.. So e-mail me with an address! I am leaving first thing tomorrow morning, so I will try and get it today if you e-mail me, if not, it will be when I get back! As for Trek pictures. I will post those when I get back from CHA.. I can't seem to find my camera and just need to do some looking. We got back from camping later than I thought yesterday (with the Soucy's).. and it was so much fun. I felt bad because it rained most of the day Monday but was still blazing hot, so their little kids were so miserable. But I loved spending time with Jamie and Josh.. fun people! Well getting ready to leave for CHA! I know it's cliche to say, but really excited to not only see all of the fabulous NEW product but my old and dear friends as well in the industry. I am sharing a room with my dear friend Courtney Walsh (we are going to do some fun shopping at the woodfield mall tomorrow night) and I can't wait. She is so great and just love her to death! Always fun. Speaking of new product.. so excited to find some new products to go in my class kits for FALL!! That is one of the main reasons I am going. 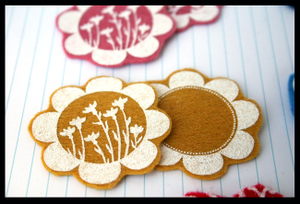 Can't wait to find some really fun papers and embellishments to use in classes and on-line classes.. I have been working on putting together an on-line class (plus kit) for August and should have it ready to post about a week after I get back. In-fact I am hoping for two.. so keep your eyes on the lookout! Oh! and an update on the retreats.. I am still planning on the same weekends in both September (for Utah) and October (for Idaho).. BUT we had a change in plans for the Utah one. I couldn't secure a place to have it where we could all "sleep". I am still looking at one more option (up in Park City).. but parking would be hard. If I can't use that one, we will actually have it in either Draper or Clearfield and it will be like the one I held in January. You will come Friday night, we will do a class and crop, then stay as late as you want.. then go home and then come back the next day and we will have 2 more classes including lunch! So if you live far away.. you may have to stay in a hotel, and I am sorry to do that too you.. but I was hoping to have it at the Scrapbook House in either Logan or Provo and they were filled up until November!! Anyhow.. when I get back from CHA I will be sending out an e-mail to all of those who sent e-mails of interest and posting about it here and start sign ups for both retreats! Can't wait!!!! well have a great week! I will try say hi from CHA and give you some fun sneak peaks! hugs! update: I will post winners from this weekend's guess Tuesday night.. sorry to do that to you.. but need a little more time! (by the way there were alot of great guesses and some pretty interesting ones too! LOL). I will also post an update on the TREK.. and all I can say is WOW!!!! had an amazing time, it was hard and it was hot, but I would do it again in heartbeat. More on that on Tuesday too, along with pictures!